Bidtellect makes native easy and effective, our copywriters and graphic designers are available to assist with the creative production. Min of 3, Max of 10; JPEG or PNG files; Max file size 2MB; Min 500×500 pixels; Rec. size 1200×1200 pixels, Images should be free of text. Min of 3, Max of 10. JPEG or PNG files; Max file size 1MB; Min 500×500 pixels; Rec. size 1200×1200 pixels, Images should be free of text. Audio is supported. AAC audio is recommended. JPEG or PNG files; Max file size 150kb; Ideal sizes are 1000×750 and 1200×1200 pixels, Images should be free of text. We only require 1 tag per image set. Our platform and technology converts your basic creative assets into real time native ads, handling all resizing dynamically. We accept Facebook images on our spec, so using your Facebook creative assets on Bidtellect’s platform requires no additional work on the advertiser’s part. Our platform does all the work. If you’d like new creative assets, leverage our internal creative services team, [b]+studio, to optimize existing creatives from social, search or display and create custom content assets for Native. Please allow 48 hours to properly test and implement tags. The conversion pixel should be placed at the confirmation page or a thank you page post transaction. This would be after a user has made a purchase, registered for something, or any action you would like to measure for the campaign. Additionally, the conversion pixel can also be placed on any page where you’d like to measure post-click activity, regardless of transaction or not. For example, if there is a secondary click that an advertiser wants to measure after landing on the homepage, the Bidtellect conversion pixel can be placed there. At this point, advertisers can only utilize one conversion pixel per IO. The retargeting pixel should be placed on any page on an advertiser’s site where they’d like to collect a pool of users to remarket on the same or subsequent campaign. For best practices and scale, we recommend that the advertiser place the RT pixel on their homepage or any page that generates the most volume in order to collect the largest user pool. The RT pixel can also be placed on multiple pages, including the advertiser’s landing page. 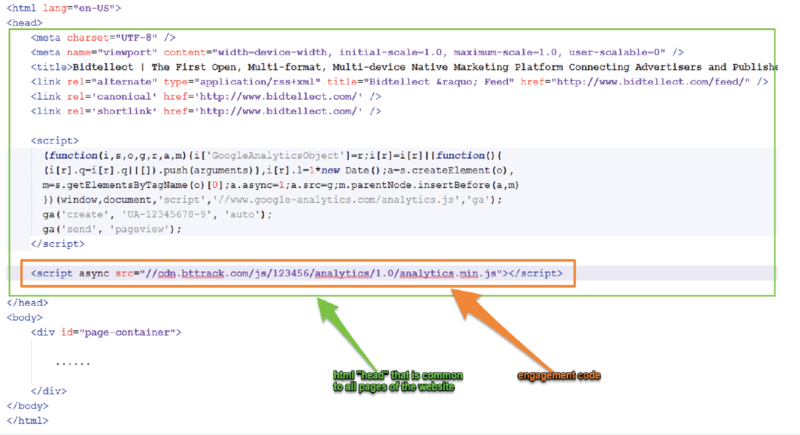 The Engagement Code should be placed in the template header (com- mon head HTML tag) so that we can track user behavior across multiple areas of your site. If the template header is not possible, The Engagement Code can be placed in a common container footer that runs across your site’s subdomains. Bidtellect’s nDSP is built on the IAB’s OpenRTB 2.3 spec, which enables the necessary communication between DSPs and SSPs to scale the delivery of Native ads in RTB environments. This technology takes the deconstructed assets of a Native ad and assembles and deploys it in real-time.